Dynamite Entertainment’s parent company, Dynamic Forces, is turning 25, and they’ve hooked up with Humble Bundle to create the Dynamic Forces 25th Anniversary bundle featuring a wide variety of comics from their long history. This new digital bundle features over 150 issues and three art books. Fans can pay what they want via the different thresholds and is available for a limited time here. And by limited time we mean the next 20 hours. To help promote that bundle, they’ve sent us some free comics to run over the next few days. 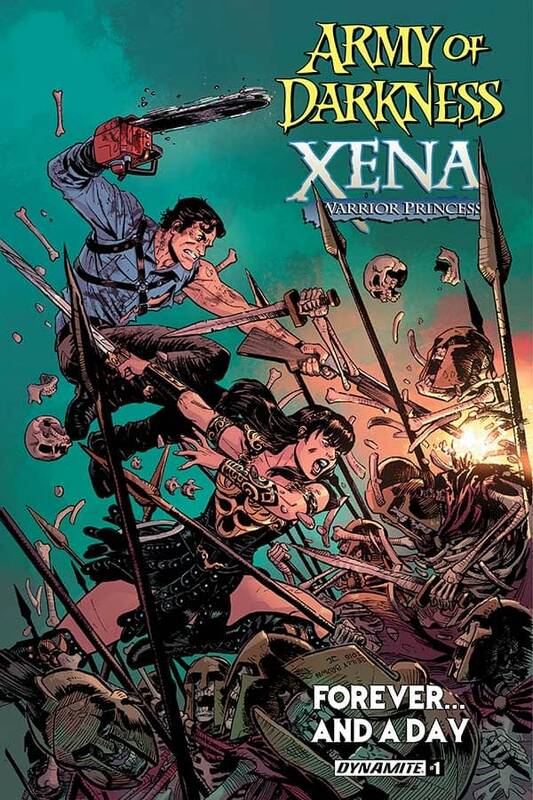 Here we have Army of Darkness / Xena: Forever… and a Day #1, bringing together the much-loved Ash Williams with Xena: Warrior Princess in a story by Scott Lobdell and Elliot Fernandez. The cover above is by Reilly Brown. All six issues of Army of Darkness / Xena: Forever… and a Day are available as part of the bundle for a limited time here. What Is… Venom: First Host?